The tenon saw is the larger saw in the first photo. I purchased it along with the x-cut saw that I have blogged here. 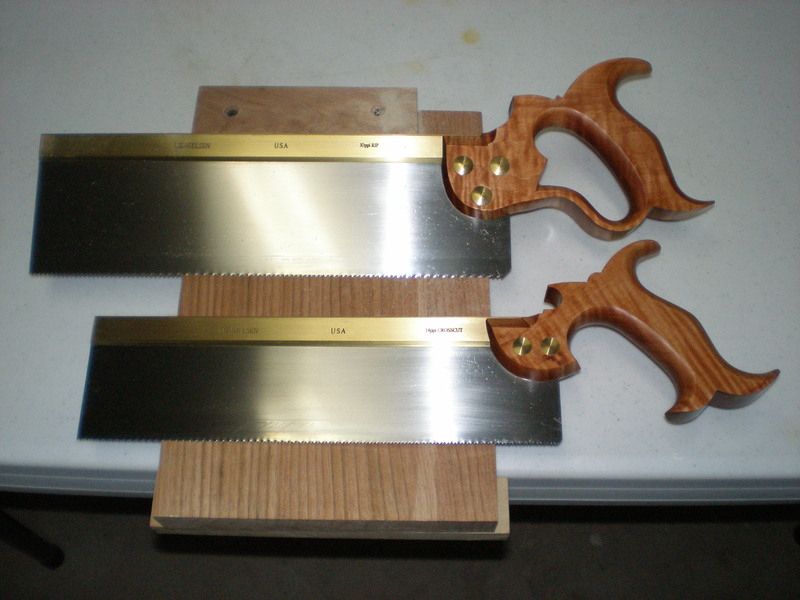 The photo shows the contrast between the two saw types. Obviously the tenon saw is much larger, hence requiring the closed handle design. Out of the box, my impression was the same as that of the crosscut carcass saw. This saw is substantial, beautiful, and just down right awesome. The curly maple handle is a thing of beauty, and the fit to my hand was perfect. It easily fits three fingers and has for what seems to me the perfect angle for cutting. It just feels comfortable when sawing. The other thing you notice right away is the size of the folded brass back…it’s thick! It puts my old Stanley to shame. It really stiffens up that large blade, which is a huge plus for me and my modicum of sawing talent. You can once again check out all the specs at Lie Nielsen. They do offer this saw in both rip and x-cut configuration, as well as larger sizes. 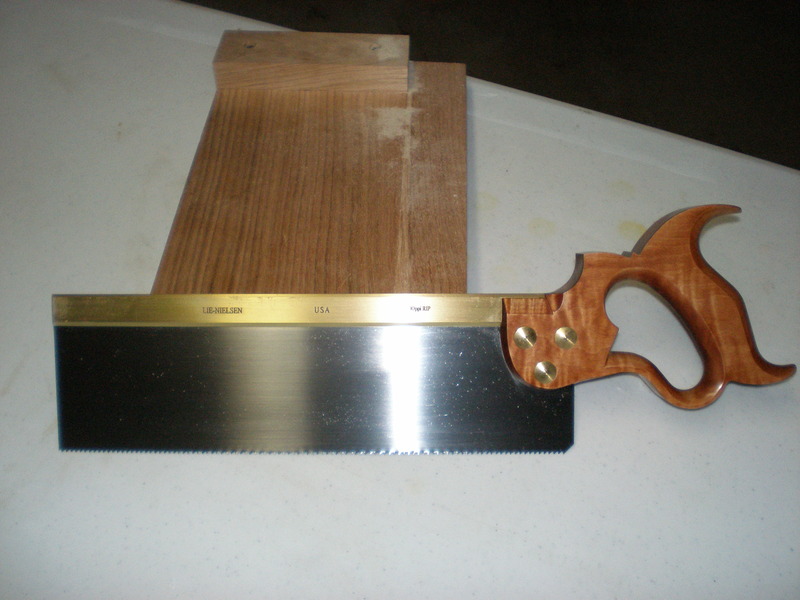 I went with the 12″ rip version because I plan on using it for sawing tenons less than 3″. I can’t imaging needing something larger, but you never know. I have been using this saw quite a bit on my workbench build. Overall, this saw has been fairly kind to me. I am not loving as much as the x-cut carcass saw, but that is most likely due to my technique. The issue I have is starting this saw. It’s a lot of touch and go…there are days when I can start a cut on the first push. Then there are days when I try to start the cut and can’t…after six or seven tries, I have to walk away and start over. I think it just takes some getting the right angle and pressure on the saw…when I let the saw do the work and take the weight off of it, it seems to start the cut nicely. The forgiveness is not as great as the x-cut carcass saw…it has to do with the saw filed rip. You just can’t start it the same as a cross cut saw. If you try to pull back a few starter strokes, the saw with get hung up and jump all over the place. You have to start on the push stroke…which takes a little getting use to. Hopefully, as I use this saw more and more, this issue will disappear. Once the saw cut is started, the saw performs quite well. The first tenon, and every tenon I cut after that, didn’t require any fine tuning to fit a mortise. That’s impressive as I have just switched to hand tools and cutting tenons by hand. I won’t ever say that a tool will help you with your technique, but I will say that this saw shouldn’t hurt. The saw tracks in the kerf nicely, cutting straight and square. I’ve got a few more tenons to cut on the workbench build…so I’ll keep putting this one to the test. I have returned this saw to Lie Nielsen in exchange for their 16″ Thin Plate Tenon Saw. The use of the 12″ saw worked well for my workbench build, but I haven’t used it since. The kerf is just far to wide for the work I do. Lie Nielsen was great about exchanging my saw…that’s why I love them so much. If I had to do it over again, I would definitely cough up the extra $20 for the 16″ thin plate saw. It starts so easily, and the kerf is small, and it cuts so easily. I will never need another tenon saw.